Picturesque Ziro is 200 km from Itanagar at an altitude of 5,000 ft (approx.). 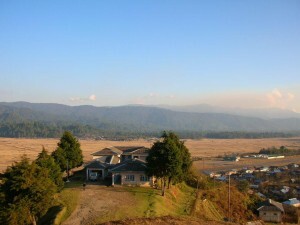 Situated on the Apatani Plateau and surrounded by pine-mantled hills all around, it is spectacular. Well connected by bus to Daporijo the district headquarters of upper; Subansiri, it’s a tourist’s delight with its dealing landscapes and tribal culture. Make a point to visit Tarin, the high-altitude fish farm, the famous whispering pine grove and the craft centre. From a hilltop, catch the first rays of dawn lighting; up the stunning emerald patchwork quilt of nature A visit to an Apatani tribal home is a must. The Apatanis are one of most advanced and intriguing of Arunachal tribal people. Both men and women tattoo themselves and the women are distinctive with their great nose plugs made of bamboo and face tattoos. It has now been banned. The Apatanis grow rice by terrace farming; they also have created an indigenous irrigation system, which’s unique amongst the Arunachal tribals, The Apatani village comprises of long rows of houses with a fertility totem in front of each one. In their cooking, they use an indigenous herbal salt that’s rich in iodine. Living jin perfect harmony with nature for every tree they fell, five fresh saplings are planted. The weaving skills of their women are legendary as can be seen from the wonderful Jikhe pattern, woven jackets and intricately patterned Jilang shawls. Driving down to picturesque along and on to Pasighat, on the road that hugs the Subansiri River is pure delight. This entry was posted in Arunachal Pradesh, Ziro. Bookmark the permalink.